Credit Card Cash Advances: Blessing or Curse? So you need to get your hands on a large sum of cash quickly and are thinking of taking a cash advance on a credit card. Before you use one of those little convenience checks that come in the mail or run to the ATM to withdraw money, make sure you understand how taking cash advances on credit cards works. Part of the appeal of a credit card cash advance is that it doesn't take very long to get the money. Most credit card companies offer the option of having a cash advance deposited directly into your bank account so you can get the money faster. You can also choose to write a check to pay off other creditors or make purchases. This type of credit card offer may arrive in your mail as a balance transfer deal. This quick access to money can be useful if you are strapped for cash and have nowhere else to turn, but there are some pitfalls to using credit card cash advances. One of the biggest reasons not to use a cash advance unless absolutely necessary is to avoid excessive fees. Cash advances usually come with a fee that can be as much as 3% to 5% of the amount borrowed. Getting a cash advance through an ATM involves even more fees. 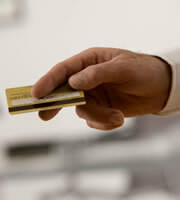 Credit card rates for cash advances also tend to be higher than interest on regular purchases. Low teaser rates for cash advances only last a short period of time. You could end up paying interest of 25% or more for taking a cash advance on a credit card. Take a look at your credit card terms to see if interest on a cash advance begins accruing right away. If so, you end up owing a finance charge even if you pay the bill in full when the statement arrives. Another thing to consider before using cash advances is whether or not you actually have a problem managing money. One sign that you may be in over your head with credit card debt is if you constantly shift your balances around with cash advances and balance transfer offers. That could be a sign you need help with debt. A reputable credit counselor can help you work out problems with credit card debt. 0 Responses to "Credit Card Cash Advances: Blessing or Curse?"